Can the Alligator Save Louisiana's Economy? The cutting room was shaded and refrigerated, and if it weren’t for the skinned and bloody carcass splayed out on a bi-level stainless-steel table in front of us, arms hanging over the sides (claws still covered in scales, as though it were wearing gloves), and the man with the big knife slicing off chunks of the alligator’s flesh, it would have been a pleasant respite from the day’s brutal heat. Outside, it was humid, over 90 degrees Fahrenheit, and a fetid swamp stink hung over the parking lot just few dozen yards away from the Manchac Pass, a thin waterway connecting southeastern Louisiana’s two great lakes, Maurepas and Pontchartrain. Earlier, while eating lunch at a restaurant nearby—Middendorf’s Seafood Restaurant, “Home of the World Famous Original Thin Fried Catfish!”—I had heard a rumor that somewhere around here was an alligator hunter named Hayden Reno who, if I was lucky, would be skinning a captured beast today. So I wandered through the parking lot, past ramshackle buildings and weeds sprung up through cracked concrete, not sure what, exactly, I was looking for. Then I saw the sign, hand-painted and nailed to a wooden shack: “Fatboys Alligator Dinners.” Beyond the sign were Reno’s stamping grounds where, for a fee, he’d cut you off a piece of just-caught gator meat and serve it to you for dinner. The fact that gator was on a menu in 2014 is no small feat. Just a few decades ago, the American alligator was hunted almost to extinction in Louisiana. For many decades after, the reptile was hunted in small quantities. But after the Industrial Revolution, the construction of commercial tanneries in New York and Europe enabled the mass production of things “exotic” skin shoes, bags and accessories, and demand for alligator skins increased exponentially. Combined with few regulations and plenty of poaching, this led to ruinous overhunting—and by the 1950s, the hunt was scant. In 1962, alligator harvesting was banned statewide, and the American alligator was listed as an endangered species in 1967. In an effort to revitalize the gator population, the Louisiana Department of Wildlife and Fisheries (LDWF), led by marine biologist Ted Joanen, launched a project to study the life cycle of the animals, and designed a program to eliminate poaching. “Marsh to Market” went into effect in 1972, allowing landowners to apply for “harvest tags” assigned to their property (which enabled hunters to take a prescribed number of gators from the approved land areas). These property owners were also now permitted to sell alligator eggs to farmers—so long as a fixed number of hatchlings were released into the wild. These two policies empowered the landowners to monitor poaching practices on their properties, and provided hunters with a legal means to make money on their catch. And finally, that year saw the opening of the first public hunting season in a decade: a 13-day-long hunt in Cameron Parish. 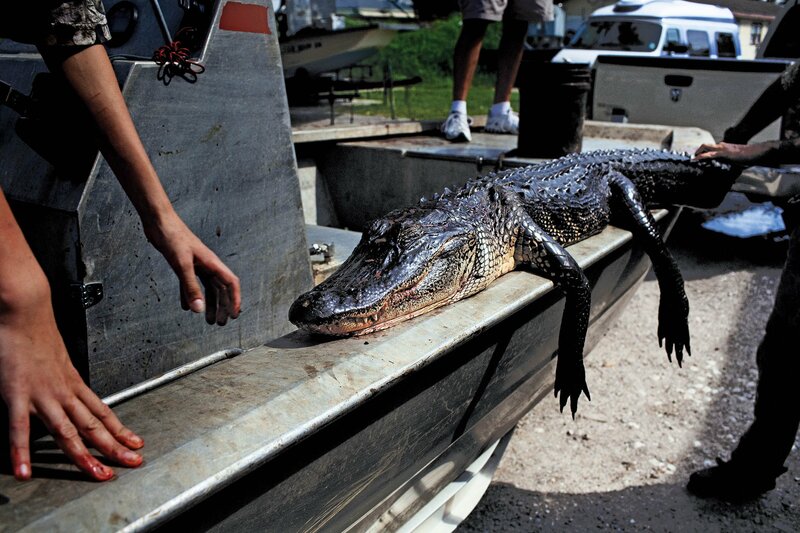 Gradually, the gator population grew, other parishes were added, and by 1981, hunting season was opened statewide. The program was a massive success and, as its name implies, was all about the market economy. “The best thing people can do for the alligator is to buy alligator products. Buy a belt or bag or boots, and wear them with pride,” Joanen, now retired, told the Capital Research Center in 2013. His words are gospel in the region: A popular bumper sticker says, “Save an Alligator, Buy a Handbag.” Joanen’s team revitalized the Louisiana alligator population by convincing rural landowners that these dangerous animals were worth keeping around—and could be worth beaucoup money. It’s great for nature, but even better for the local economy, because alligators are a valuable resource; “conservative estimates,” according to the LDWF, put the total value at $704 million. The annual harvest has escalated in recent years. In 2012, the most recent year for which data are available, 34,376 alligators were recorded as “taken” from the wild—the most since the LDWF began keeping records in 1972. Add to that the 280,000 alligators harvested at farms and the total value of the skin and meat combined was over $79 million in 2012. And these numbers may skyrocket soon. Just last year, Louisiana State University cut the ribbon on the “Alligator Research Station” outside the Baton Rouge city limits. The stated goal is to do for the “alligator farming industry what science has already done for the cattle, pork and poultry industries.” In other words, if LSU scientists and the industry funding the research have their way, factory-farmed alligators may be on the horizon. Led by Robert Reigh, a veteran aquatic animal nutritionist, the Alligator Research Station is starting by figuring out how to optimize gator feed. The discovery by cattle farmers that growth hormones could be added to the cows’ food to speed their development, and that they could quickly “finish” (i.e., fatten) their cows by feeding them a corn-based diet for three to six months leading up to slaughter, fueled the explosion of the beef trade in the 1950s and 1960s, and pushed beef past pork as America’s meat of choice. The day after I saw Reno break down his alligator carcass, I saw a few of the apex predators in the wild. We were in the Jean Lafitte National Historical Park and Preserve, a protected swamp that was like something out of Faulkner: Spanish moss hanging off cypress trees, grasshoppers the size of a standard Office Depot stapler, and dangerous reptiles lurking beneath our feet, still as a sunken log until they smell dinner…when they launch their serpentine bodies at prey with startling speed. “Alligators eat just about anything they can catch,” says Reigh, and that’s almost always other living things. That’s why alligators on farms today are fed a lot of animal protein. However, that doesn’t mean that’s what they should be eating. “Even though they have a carnivorous lifestyle in the wild, they are able to digest plant products,” Reigh adds, suggesting that a more balanced (or even vegetarian) diet could lead to gators that grow bigger, faster, cheaper. It’s too early to tell—the station built its in-house alligator tanks in January 2014, and filled them with live animals only in mid-September. They’ll be testing a variety of feeds, but Reigh already has an inkling of what they’ll find. “Animals tend to be more alike than different in terms of what they need to eat,” he says, hinting at the possibility that you might soon see Gucci purses made from corn-fed alligators. The potential for growth in the gator skin industry is tantalizing in a state that is one of the poorest in the union. 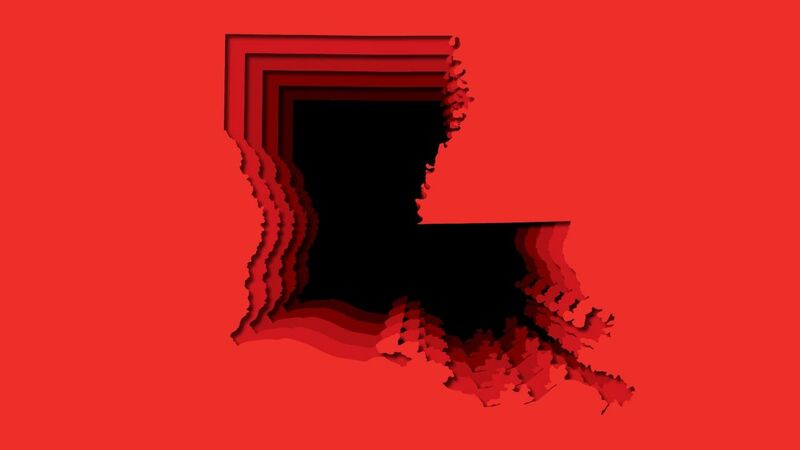 According to the U.S. Census Bureau’s 2012 American Community Survey, for example, Louisiana households had a median income of $39,085, third lowest in the country; only Arkansas and Mississippi residents made less. It continues to be plagued by crime, much of connected to poverty; according to a recent FBI report, Louisiana has the seventh highest violent crime rate in the country and the fifth highest property crime rate. The gator farmers hope Reigh’s work will lead to regional industry growth like what the Midwest saw with cattle in the middle of the 20th century—making them millions and adding plenty of jobs to the region. Alligator farms are mostly family affairs right now, but it’s easy to imagine a future in which the farms become one-stop-shops, with a polished product that could lure buyers from New York, Paris and Milan, and funnel wealth directly back into Louisiana, bypassing the out-of-state and foreign tanneries. In the 1950s and 1960s, a handful of Midwestern cattlemen turned their farms into factories and moved from the fields to the boardrooms; in the 21st century, maybe a few entrepreneurial gator farmers will move from the swamp to the penthouse. Not everyone buys into that vision. “A more prominent alligator industry might help tourism just a little, or improve ratings on the L.A.-based reality shows, but it is not likely to grow into something that would have a big impact on the overall statewide economy,” says Stephen Barnes, an assistant professor and the director of the Division of Economic Development at Louisiana State’s business school. On the other hand, as Barnes suggests, “alligator farming is one of those industries that makes a unique contribution to the state’s culture,” and it can drive a lucrative trade in tourism. After a deep plunge in tourism following Hurricane Katrina, interest in the region and culture has skyrocketed in recent years. As Barnes noted, TV shows like the History Channel’s Swamp People have drawn in record numbers of viewers in recent years, and real-life visitors spent $9.9 billion in Louisiana in 2012, compared with $6.4 billion in in 2006. Lots of these dollars go to the jazz clubs on Frenchman Street, the watering holes on Bourbon Street and the various other assorted and often sordid attractions of New Orleans, but plenty ends up out in the bayou, too. That’s a lot more than 10 alligators would sell for on the open market, dead or alive.